"Grease a kid or a quarter of one with lard and cleaned garlic cloves; put it on a spit and turn it by the fire. Baste it often with sprigs of bay or rosemary and the sauce I shall now describe. Take verjuice and the juice of the meat, the yolks of two eggs well beaten, two cloves of garlic well pounded, a pinch of saffron and a little pepper, and mix this and pour into a dish. With this (as I said) you baste what you are cooking. When it is done, put it in a dish and pour some of the sauce over it and sprinkle with finely chopped parsley." Pans needed: Cast iron dutch oven. Using a cast iron pot, rather than a roasting pan, helps to deliver even heating to all sides of the meat, in a manner similar to being roasted on a spit. A probe thermometer for measuring the temperature as the meat cooks – they definitely did not have something like this in the Middle Ages! However, we have them now, and we can certainly take advantage of this. Lemon juice is used here as a substitute for verjuice, though white wine vinegar can also be used. Place dutch oven into oven, preheat to 450 degrees Fahrenheit. As the oven is heating, bloom saffron in 1 tablespoon of water: Add 1 tablespoon of water to a dish or bowl. Drop a pinch of saffron into the water, and let it soak in the water. The water will turn a yellowish color. After about 10 minutes or more, it can be used. Crush a clove of garlic in olive oil, and brush this over the lamb. Put lamb into the preheated pot, and into the oven, and turn heat down to 325 degrees F.
Pepare basting sauce: blend together the previously crushed garlic, rosemary, and pepper. Pour in saffron water. Mix in egg yolks and lemon juice. 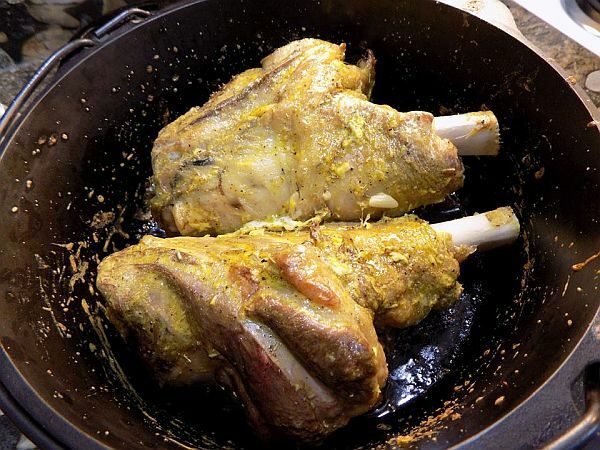 After 35 minutes, remove pot and baste lamb. Insert probe thermometer and return pot to oven. Baste at every 10 degrees until 150 degrees: at 120, 130, and 140 degrees. At 150 degrees, remove lamb, cover with foil, rest 10 minutes. 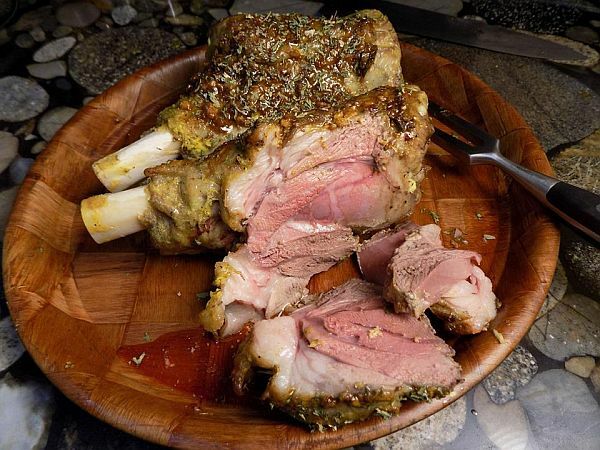 Pour pan juices over lamb, sprinkle with parsley and serve.